Madmumof7's children were challenged this week by Bird's Eye to create an exciting meal for mum to celebrate mother's day as part of the Birds Eye Teatime Handover project. They were very excited about this opportunity and spent ages browsing the company's website, eyeing up the products and wondering what to cook. A trip to our local freezer centre helped make their minds up - they decided to re-create a meal based on one offered by mum's favourite fast food restaurant! They made "Twister" style wraps with lots of fillings to choose from - Bird's Eye Hash Brown mini-waffles, sliced Birds Eye Southern garlic and herb breaded chicken breast and Bird's Eye takeaway feasts southern fried and original chicken popstars to which we added cheese, tomato, lettuce, cucumber and mayo to suit personal tastes. To make it more like the famous Colonel's establishment the children decided they needed to cook corn on the cob and skinny oven fries and have coleslaw with the wraps. They debated buying the coleslaw but then DS3 came up with a great idea! He contacted Grandma 2000 miles away in Cyprus via FaceTime on our ipad to ask if she would share her recipe for amazing homemade coleslaw. She was happy to help and even stayed online and talked him through preparing it "face to face." Isn't technology amazing? So the children all got to work and with a little bit of help from mum, dad and a visiting 7-year-old friend who became our official photographer an amazing meal was laid out on the table. And it was truly finger licking good! no frying required for this yummy chicken! DS3, DS4 and DD empty bags and boxes onto baking trays. This is a review post for which madmumof7 received vouchers to buy Bird's Eye Products. Views are the writers own. madmumof7 is a proud member of the Mumsnet Bloggers Network. The hash brown waffles seem to be a favourite. Will you be blogging that coleslaw recipe or is it a family secret? I asked my mum - she won't let me divulge I'm afraid. 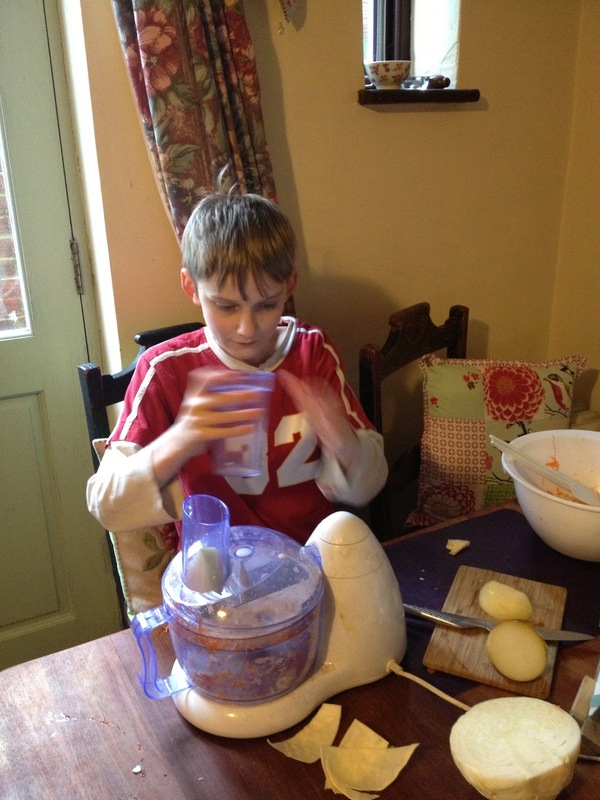 But I reckon any homemade coleslaw has to taste better than the bought stuff and is a great way of getting fresh raw veg into the kids!